Thanksgiving is sneaking up on me this year! 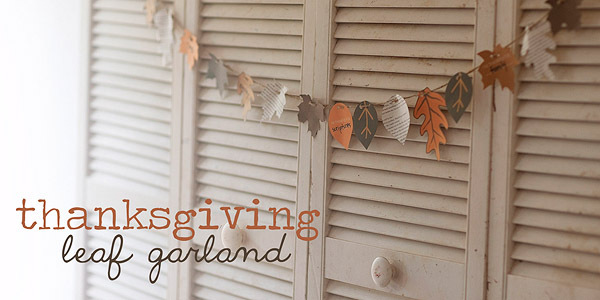 My big plans for turkey day projects are quickly giving way to big plans for traveling, cooking, baking, and perhaps even a Disneyland trip! Time is flying by way too fast. 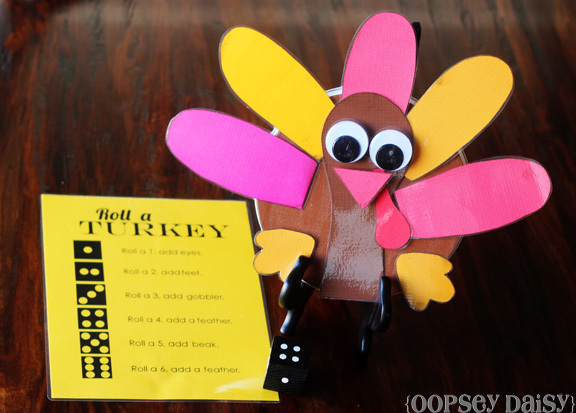 Little Man and I had so much fun with our Roll a Jack-O-Lantern game at Halloween, I decided to make this "Roll a Turkey" game the very same way! If you are interested in creating your own game, definitely check out this post where I described how to make the Roll A Jack-O-Lantern game. 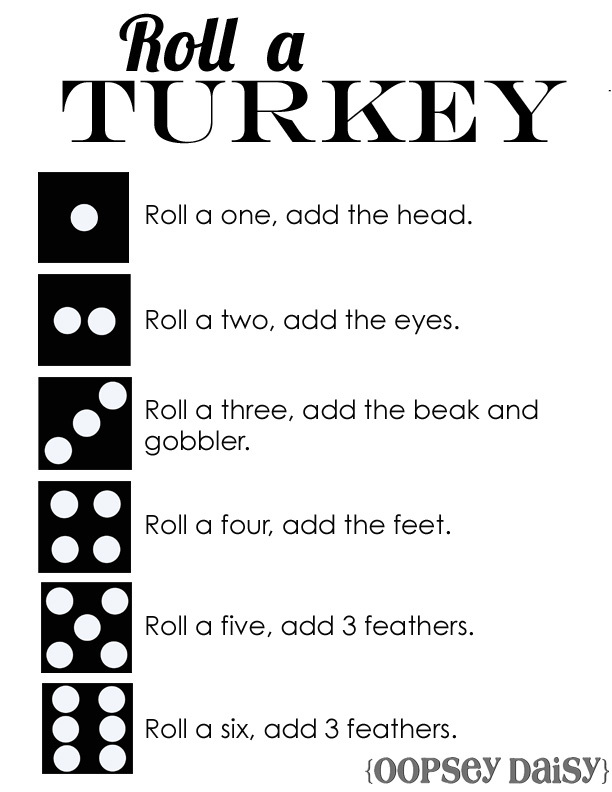 The fun part about this game is that because you are likely to roll a number more than once, your turkey may end up with 3 eyes, 8 feathers, and 2 beaks! So having extra parts comes in handy! By the way, I store all of the parts in a ziplock baggie on the underside of the burner cover. 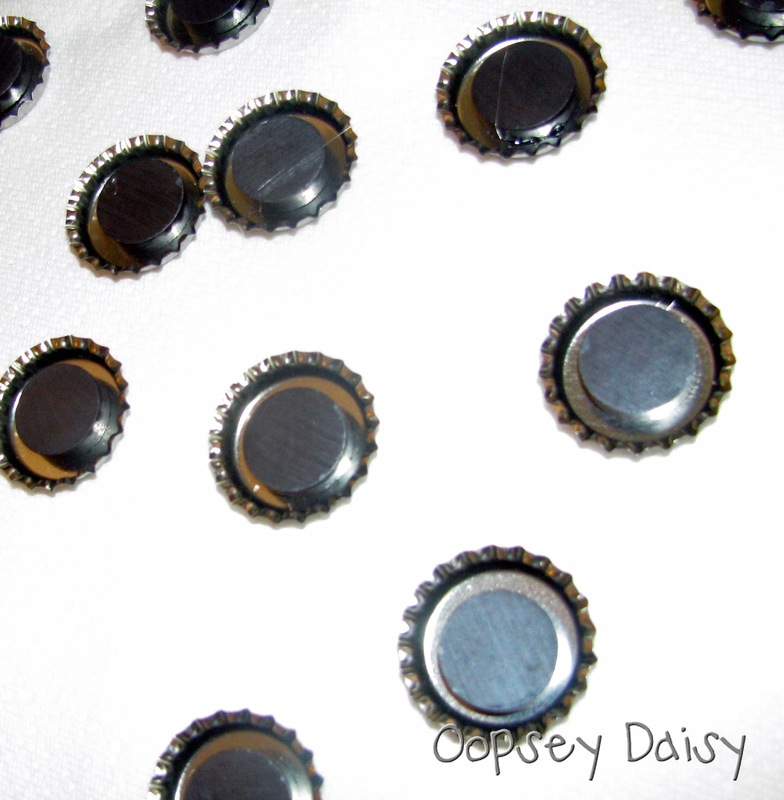 Because of the magnets on the backs of each piece, they stick nicely all on their own! 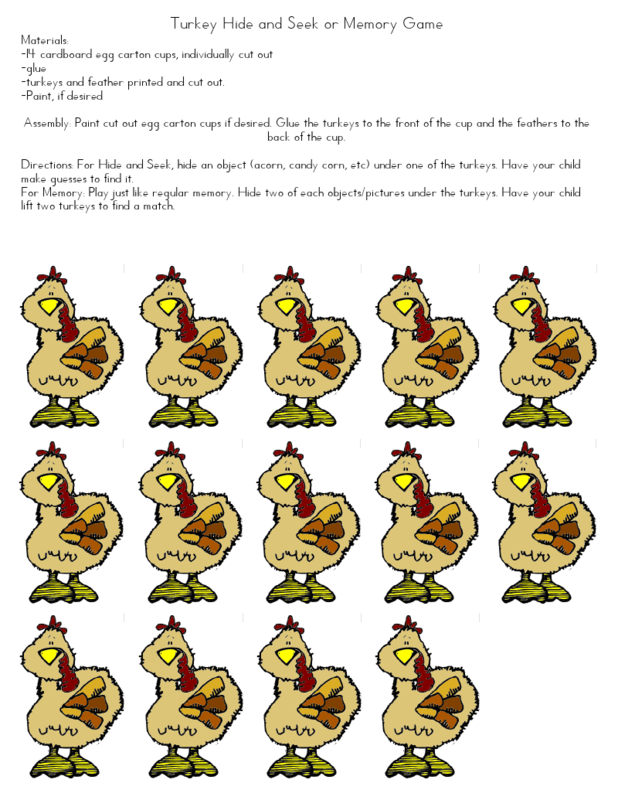 You can download your own "Roll a Turkey" game sheet here. I printed mine on yellow cardstock and laminated it. We are using the same dice I created for the jack-o-lantern game, although you can definitely use a regular game dice! Is it really November first?! I'm a little sad that all of the Halloween festivities are over. (And I'm trying to avoid munching on all of our leftover candy!) Now bring on Thanksgiving! 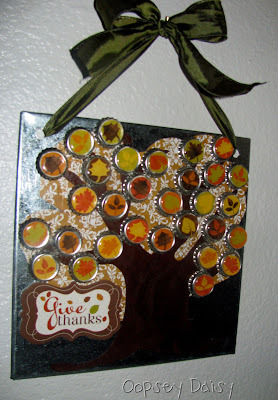 In anticipation of Thanksgiving, I love focusing on gratitude throughout November. 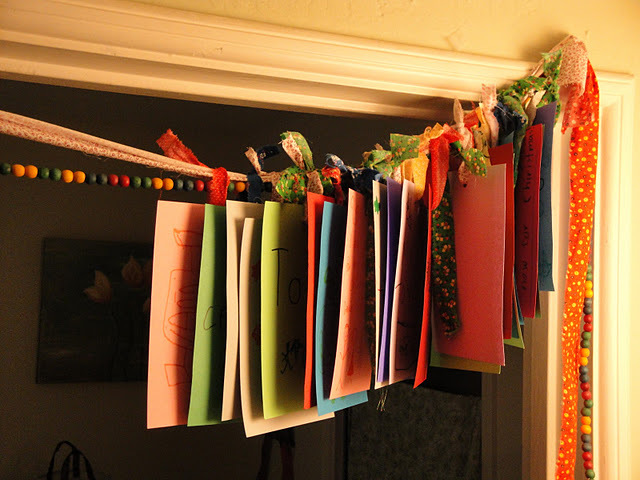 So today we are starting this gratitude tree advent calendar that I created last year. 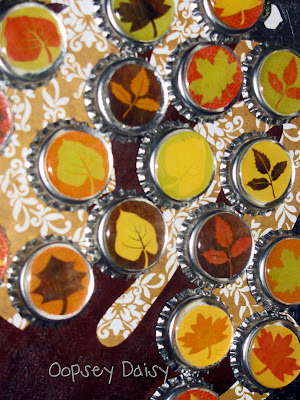 Just in case you missed this post last year, you can download your own leaves for the bottle caps and add one every day throughout November. With each leaf, a member of your family can share something they are thankful for! I call it an "advent" of sorts because we use it to count down the days until Thanksgiving! And let's be honest--Thanksgiving is passed over way too often. I like to give Thanksgiving its fair share of holiday recognition! 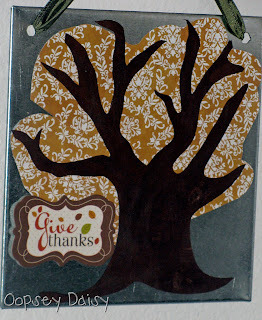 I love the elegance of this thankful tree at simply vintagegirl. 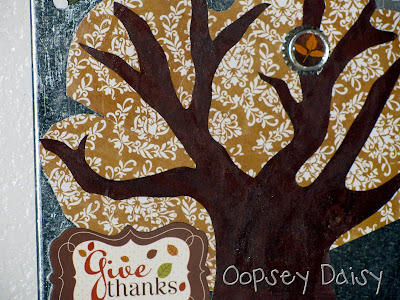 Whipperberry's Blessings Board is a lovely way to have your Thanksgiving guests record what they are thankful for! 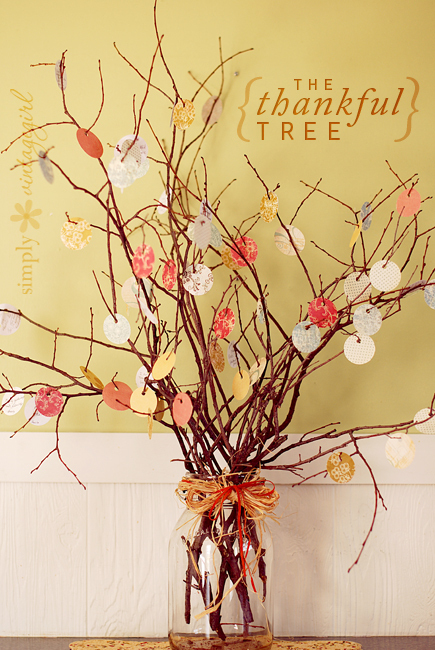 Simple As That offers the digital leaf files for this Thanksgiving leaf garland. This would be a fun family activity! 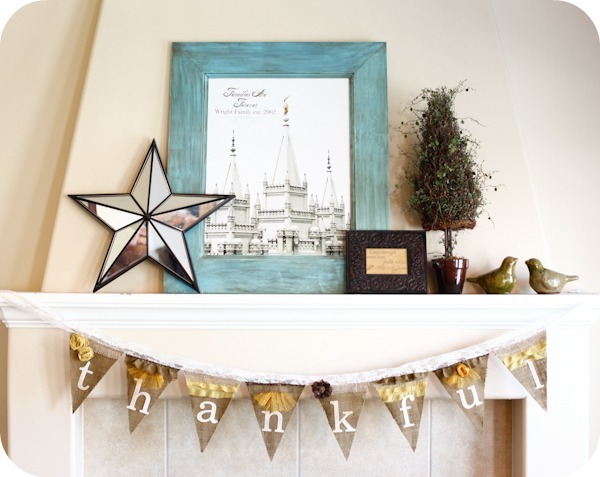 No leaves here, but this grateful garland from Misfits and Remnants is gorgeous! Roots and Wings Co. made a sweet thankful tree, too! As the leaves fall off the tree, they wrote what they were grateful for. 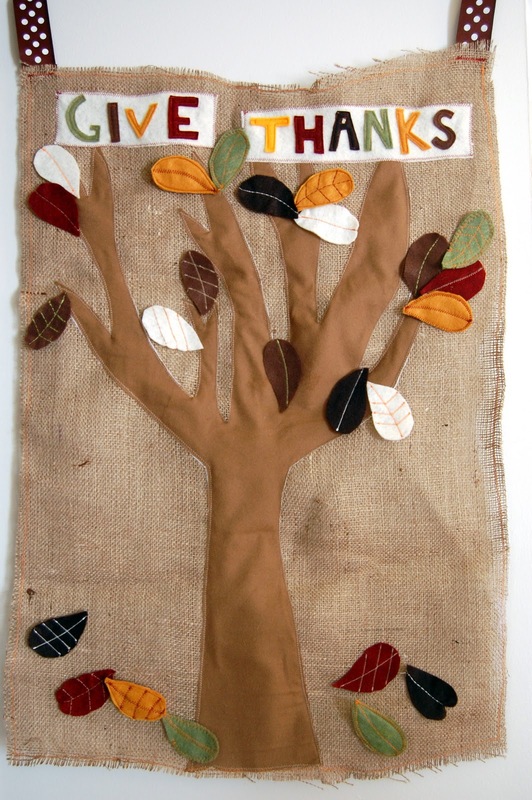 Sweet Rach from Family Ever After just e-mailed me about this darling handsewn Thanksgiving advent tree. So, so darling!! I can't believe it's already time to plan for Thanksgiving! 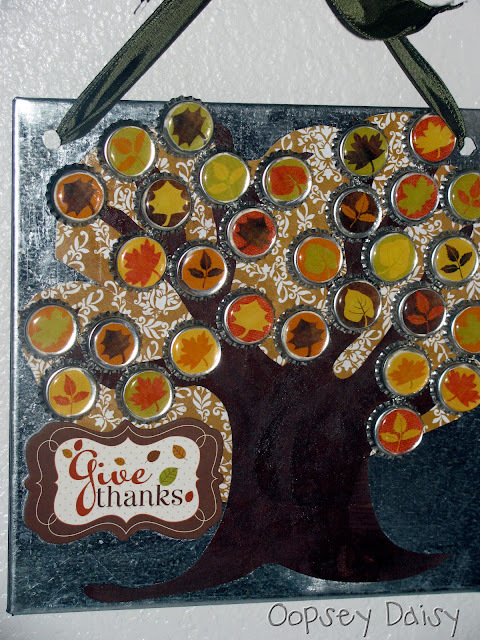 How do you encourage gratitude? The moving truck only needed to take 2 trips to bring all of our stuff over to our home!! (And we had a GIGANTIC moving truck plus we'd taken over 20 car loads ourselves during last week! We have lots of stuff!) It's an exciting but overwhelming process to get unpacked and settled in. The blog may suffer a bit as we just try to get laundry done, dishes cleaned, and boxes unpacked! I am just trying to keep Little Man fed at this point! But I feel so blessed to finally be here! Today, I just wanted to share some fabulous blog finds from last week. 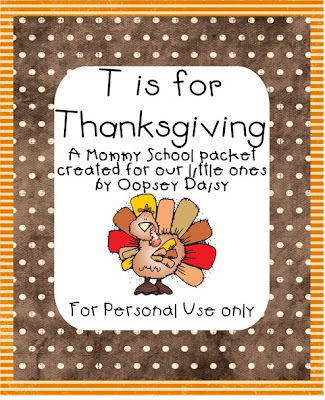 As you are making your own Thanksgiving-themed Mommy School plans, I would like to direct you to some talented bloggers who have come up with their own amazing Thanksgiving packets and printables. Seriously. These bloggers are so generous to share! First of all, my gal Daphne at Moo Moo's & Tutus is a former kindergarten teacher. She is amazing! We've decided that the two of us would make excellent "team" teachers because we are so much alike. She has developed her own "Tiny Teach" program that is very similar to my Mommy School! 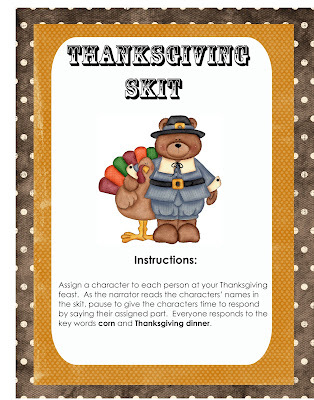 She has shared a 32-page Thanksgiving packet that you can download here. Musings of Me has tons of incredible Thanksgiving printables. They are so stinkin' cute! 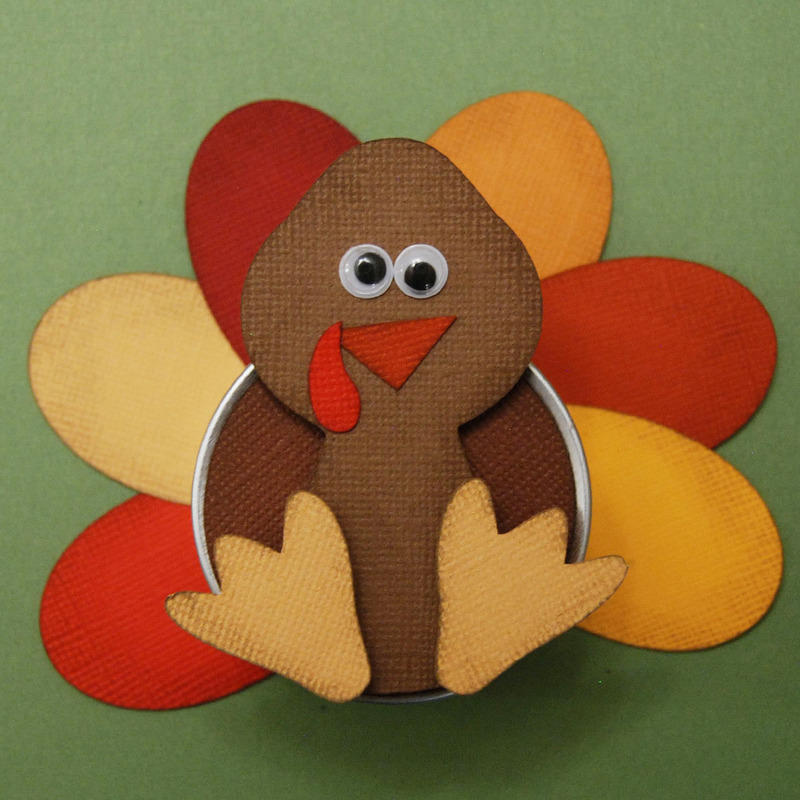 Some of my favorites include the T is for Turkey magnet page, a Thanksgiving pie lacing page, Thanksgiving trace & make cards, Thanksgiving memory, a "pin the feathers on the Indians" clip game, tracing pages,and a Thanksgiving colors book. 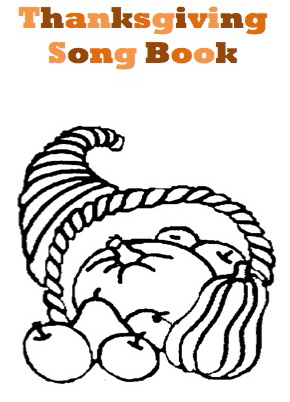 Delicious Ambiguity shares a free Thanksgiving poem and song booklet. It's a one-stop for me to find tons of adorable songs and poems! I know you'll love this! Mrs. Home Ec. 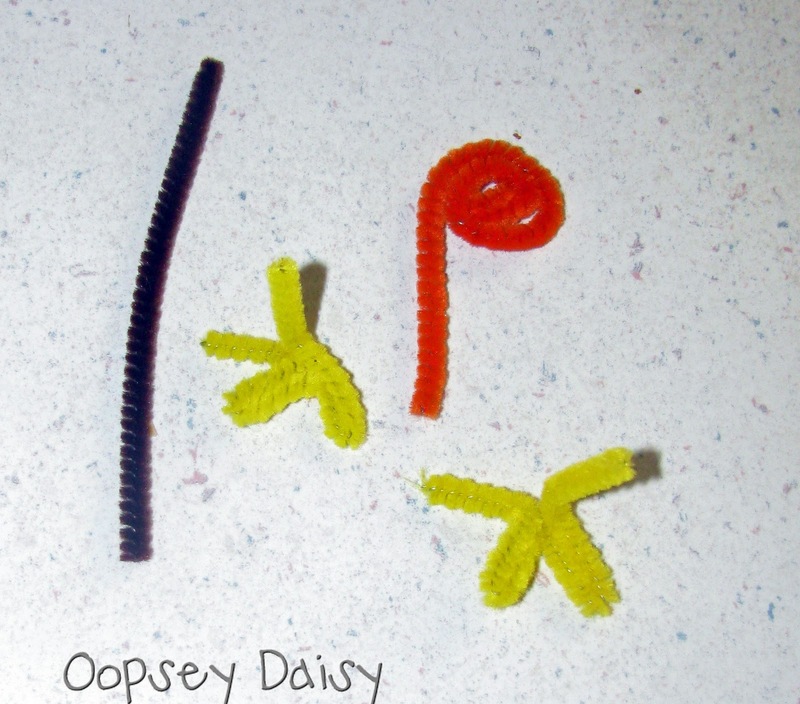 is one of my absolute favorite sources for preschool ideas! 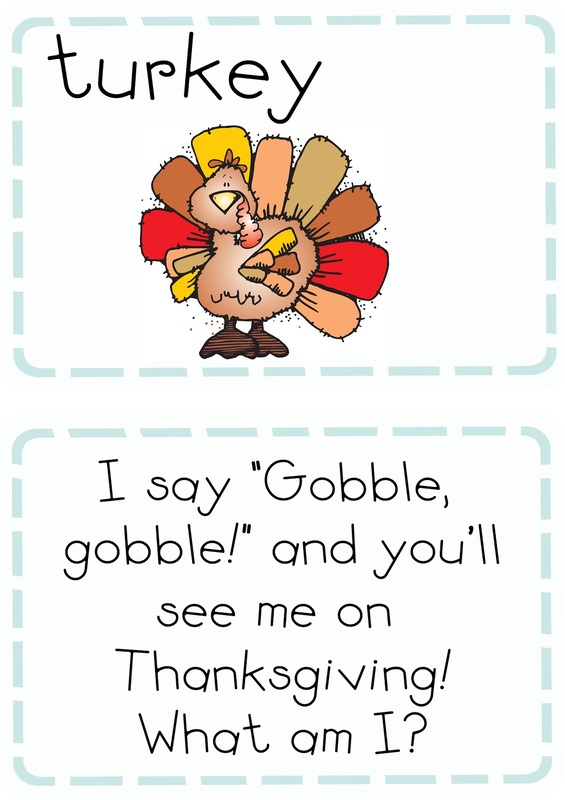 I have already printed off her Thanksgiving activities! She graciously shares a "Don't Eat Tom" game, Turkey Bingo, and Turkey Memory. All are absolutely genius! A while back, I stumbled across the cute blog, 2 Teaching Mommies. 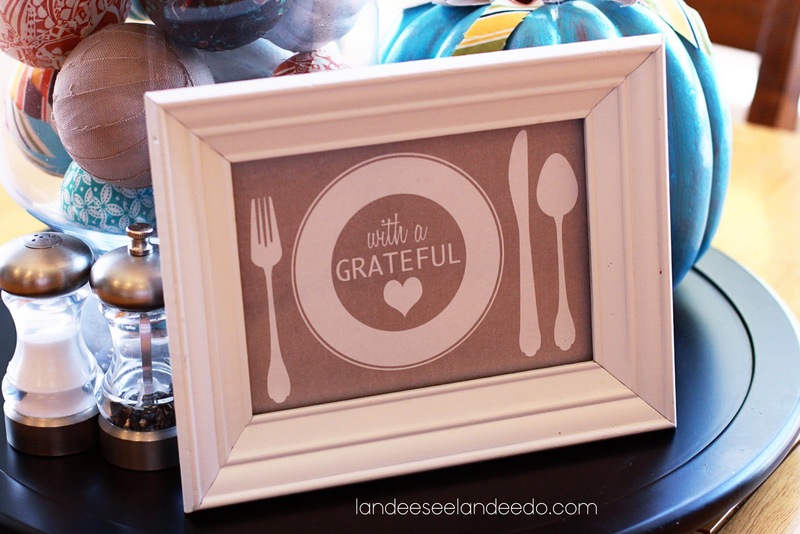 They share free printables all the time, and they are real jewels! 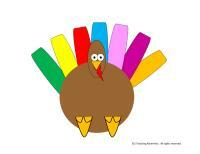 Check out their turkey printables here. 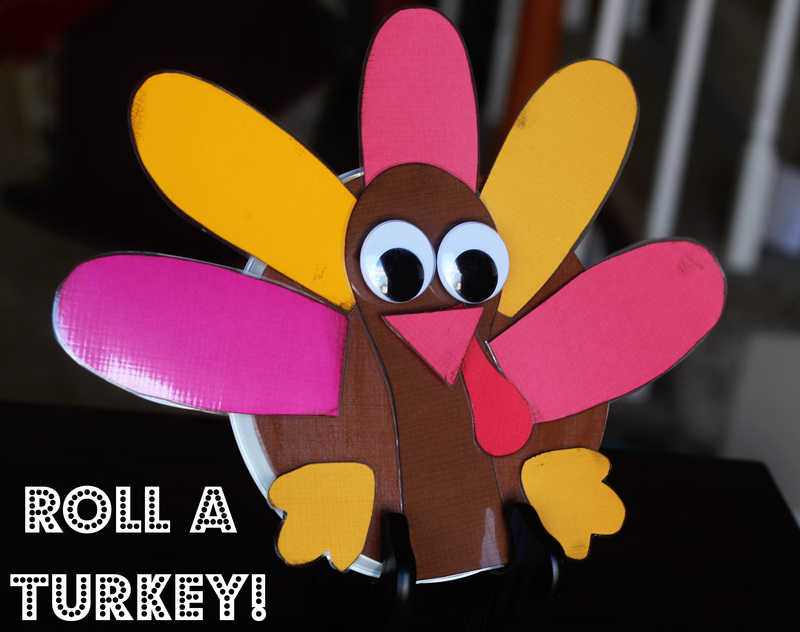 I love this little build a turkey! 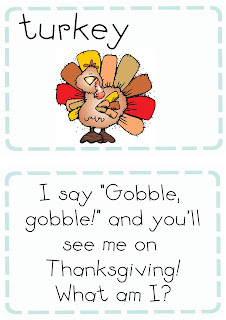 Another fabulous homeschooling blog, 1+1+1=1 is sharing a Thanksgiving Preschool Pack. Lots of cute stuff in this packet like this Turkey "color by number"! I downloaded these ladies' fabulous work last week and hurried and printed off all this before moving, disconnecting the printers, etc.! Now I'm all set to teach Little Man about Thanksgiving! 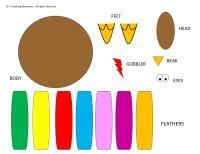 * Tons of corresponding visual aids and printables. There are TONS of ideas packed into 56 pages--there is definitely something for everyone! Be sure to review the credits on the last page for more great ideas! BUT... my friends, I am just not sure if I can justify spending 12+ hours on creating these packets every 2 weeks. I do want to share my work and make it available for our kiddos. However, I am considering creating packets in the future with all of my own work and charging a simple $0.99 download via Paypal. The L, H, and T packets will remain free... but with my husband's urging, I've decided to consider this. * I am forever grateful that DJ Inkers allows me to use their fonts and clips to create fun learning packets!! 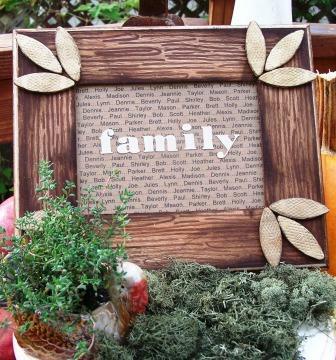 Clip art designs &/or fonts copyright Dianne J Hook. Used with permission from DJ Inkers. * This download is in PDF format. I receive a lot of technical questions that I am definitely not equipped to answer! Just be sure your Adobe is up-to-date so you can download it easily. * Please understand that I cannot e-mail you this download in your own specific format or send you modified versions of any parts of the packet. If only I had all the time in the world and all the computer skills under my belt. I can only offer this one format, but you are welcome to tweak parts of it as you wish. Thanks for understanding! * Please use this packet for personal use only. *If you download and use this packet, I would love to hear about it! You have no idea how it makes my day! The comments I receive about Mommy School touch me more than any others. I love the collaborative feeling of Mommy School. 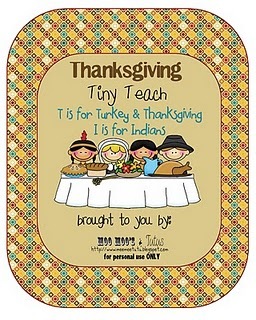 With all that business taken care of, you can download your own T is for Thanksgiving packet here or here on Scribd. Enjoy your lil' turkeys this Thanksgiving! I will be chasing my lil' turkey around our new HOUSE! Another short and sweet post today! 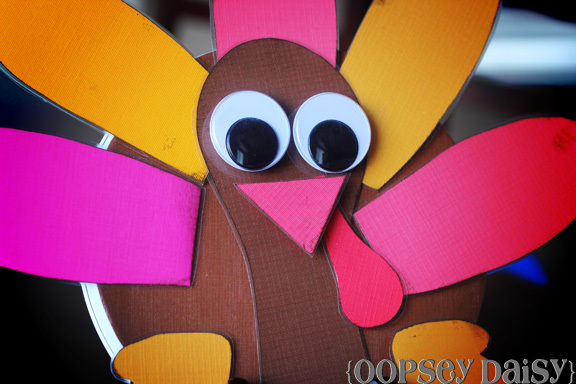 I wanted to share this hand print turkey applique onesie that I made last year for Little Man. I just traced his hand (this can be a little tricky with a baby!) 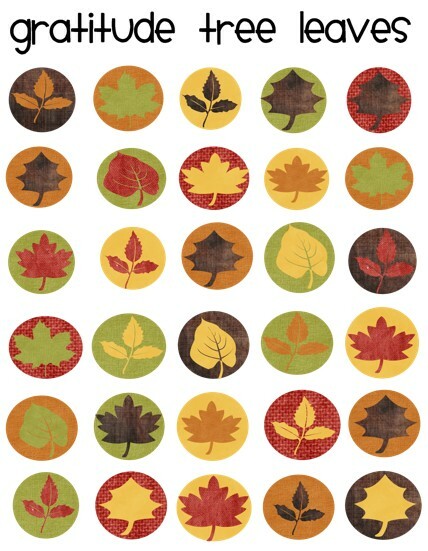 and then used this as a template to cut out the fabric. I added a felt eye and a gobbler and sewed it all on to a onesie! 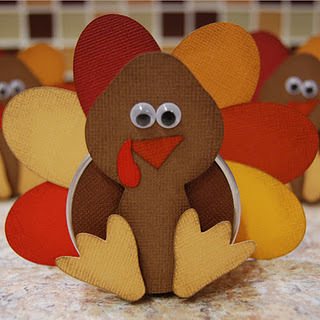 Wouldn't it be cute to hand stitch legs for that lil' turkey?! 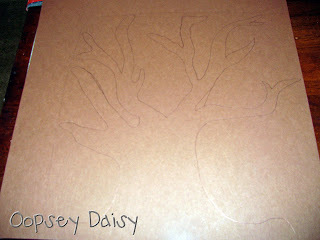 I had hoped to make a new handprint turkey applique shirt this year, but it will have to wait! Don't you love how Little Man was a bald little baby?! He was bald forever! One of my favorite traditions on Thanksgiving Day is performing a little Thanksgiving skit. We usually perform this skit in between dinner and pie. It's simple and sweet, and perfect for kids! But even a few years ago, before there were any grandchildren in our family, we were still doing this little skit! You don't need any props and luckily for me, you don't need any acting skills! A narrator simply reads a story about the first Thanksgiving dinner. Each guest is assigned a character with a line that they perform every time their name is read in the story. It ends up being tons of fun! You can download your own Thanksgiving skit here or here on Scribd. What are some of your favorite Thanksgiving Day traditions? Mr. Daisy's traveling has pro's and con's. 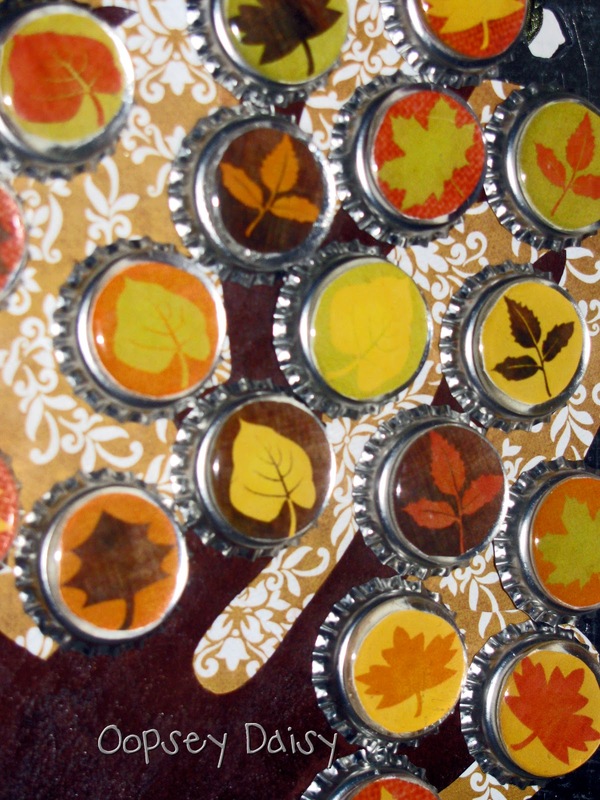 When he travels, it's perfect for crafting. But his traveling while we're supposed to be MOVING is not so much fun! He hasn't been home with us in 10 days! I'm a bit overwhelmed with unpacking from California while still packing for moving plus chasing Little Man. I am wishing I could fast forward to the part where we are happily settled in to our new place! Yet I am trying to be grateful for his fabulous job and the chance to move into a home! I am a bit out of touch with blog surfing, so in place of my regular Wednesday's Wowzers, I wanted to share some fun gratitude activities from last year's archives. I stole BOTH of these ideas last year and loved them! So be sure to check them out! 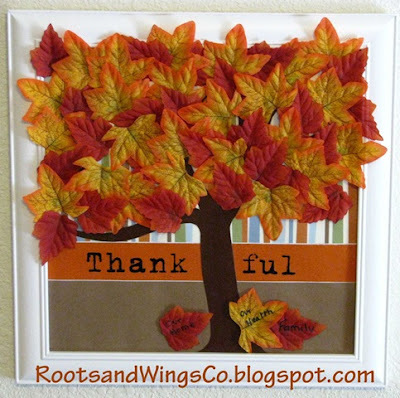 I also love this thankful jar from Blue Cricket Design. 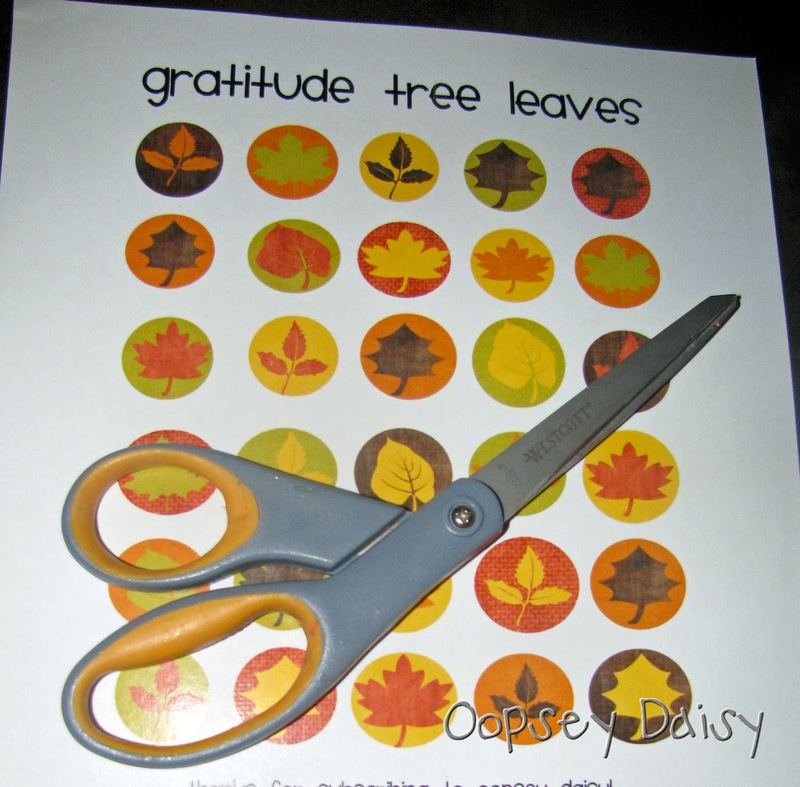 Becca has thankful activities that you can download and print and toss in a jar. Your kids can select an activity that demonstrates gratitude. Fabulous idea!! Of course you can try out my gratitude tree advent also. We're really enjoying this! 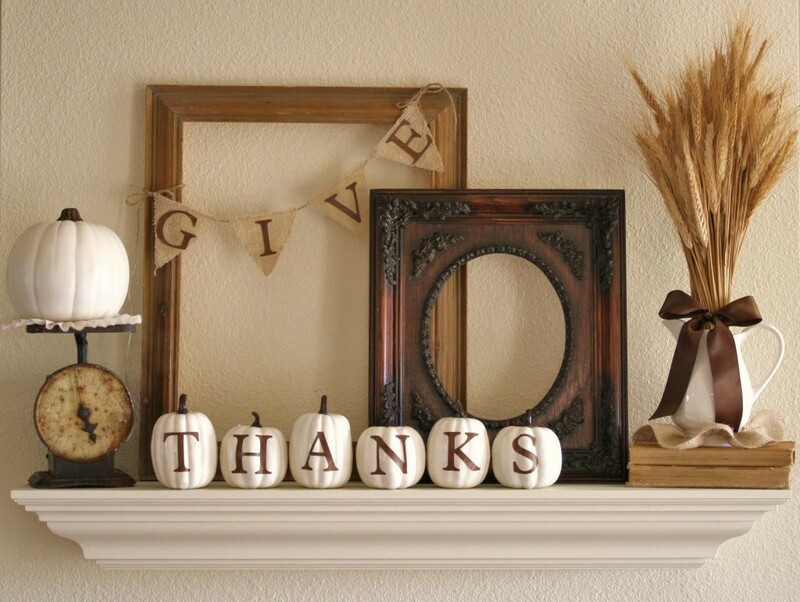 It's not too late to start showing off what you're thankful for! 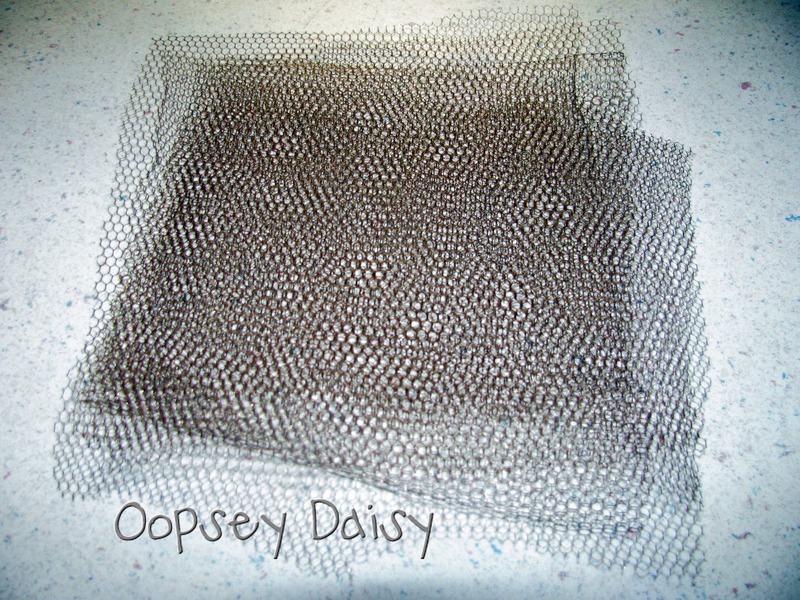 One of my favorite things about Oopsey Daisy is sharing some of my favorite childhood memories with you. Every Thanksgiving morning, usually while watching Macy's Thanksgiving Day Parade, my Mom put us to work. In between making stuffing and pumpkin pie, my sisters and I would set the table for Thanksgiving dinner. 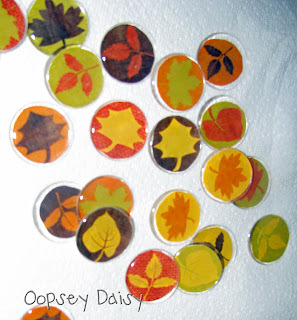 We usually created some kind of cheesy name cards to place next to each plate along with these little turkey favors. This project is one of my fav's because of its simplicity. 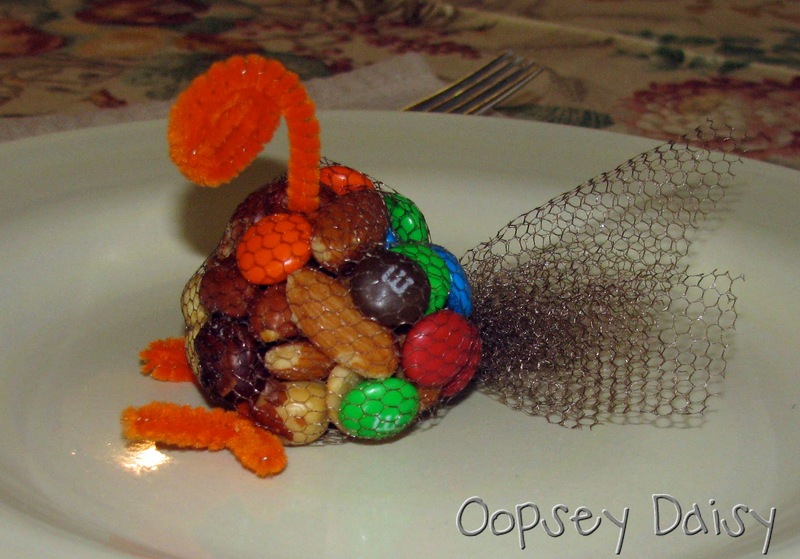 You can get your kids involved in Thanksgiving dinner with this fun (and easy!) craft! 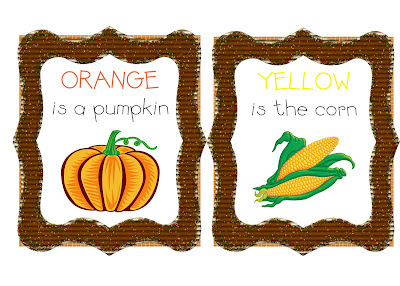 PLUS they are fun to munch on before, during, or after the Thanksgiving feast! 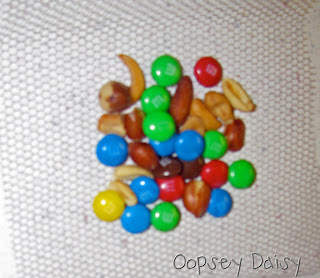 * Your choice of candies, mints, or nuts. 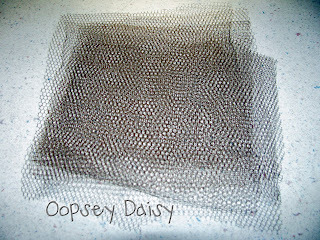 Start by cutting squares out of the brown netting. I think my squares are roughly 6-7 inches. 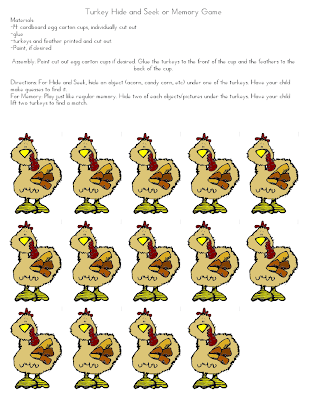 You will need one square for each turkey. 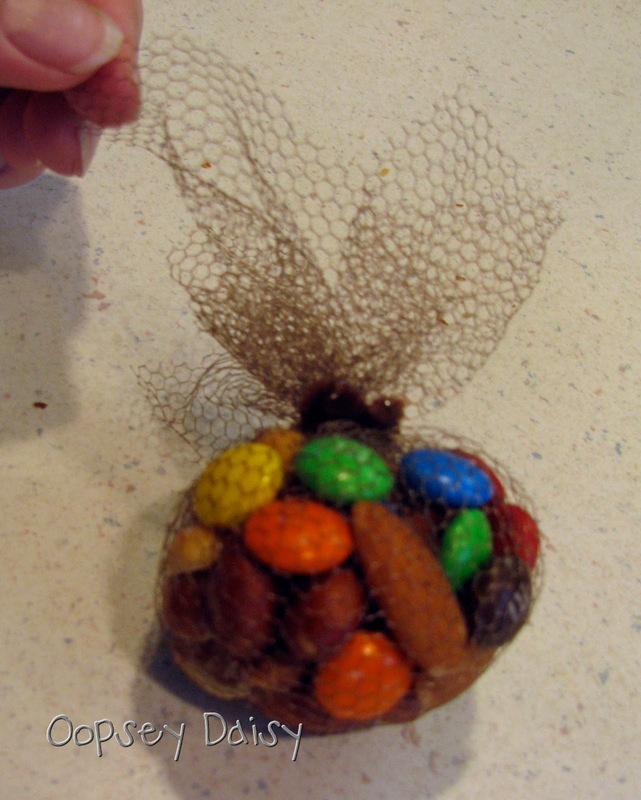 Now place a handful of treats in the center of the netting. 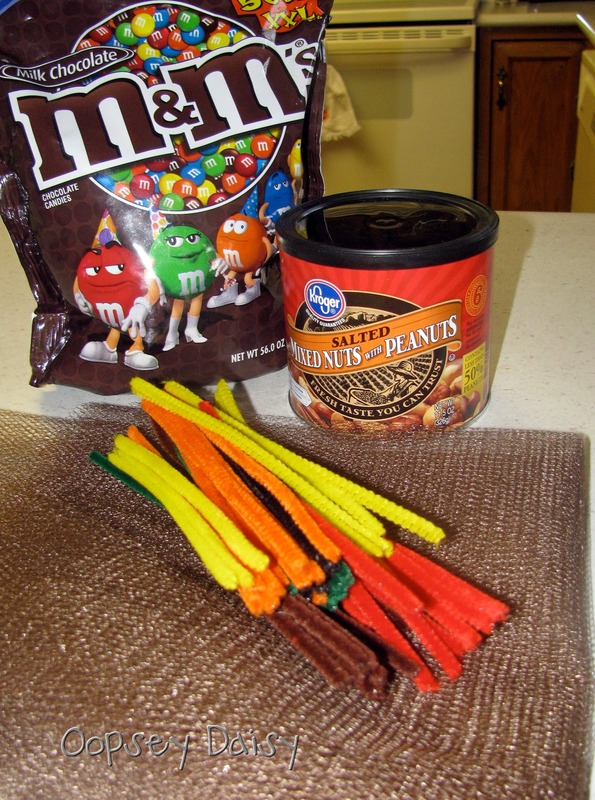 Gather the treats by pulling the 4 corners together. Twist a brown pipe cleaner all the way around the opening. We don't want any of those goodies spilling out! This next step is very important. My Mother says, you must fluff the feathers! Just insert the pipe cleaner pieces into the webbing. And that's it! 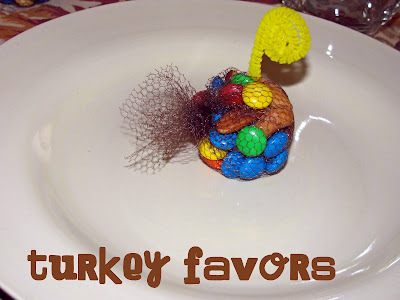 You have an adorable turkey favor for each guest at your Thanksgiving dinner! 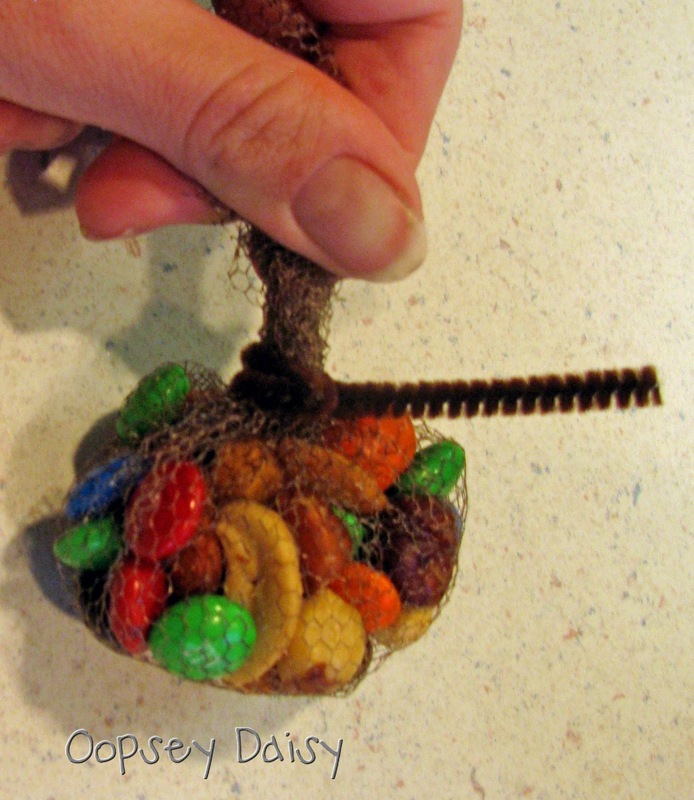 While you take turns sharing what you're thankful for, you can munch on this little after-dinner snack! 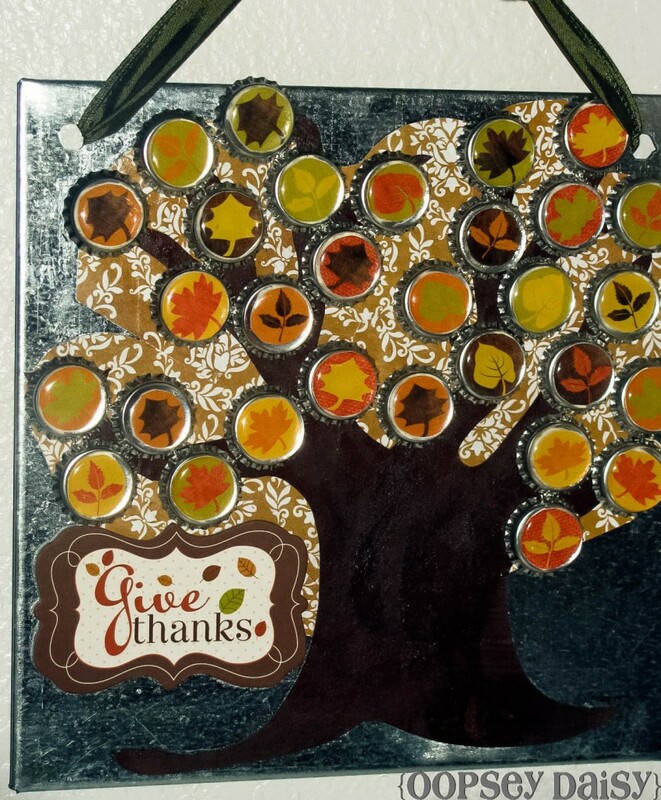 What do YOU do to involve your kids with Thanksgiving dinner?